We serve the needs of the death care industry through our licensee network with the highest quality products and services. We set the standards for graveside memorialization in the profession. We adhere to the values of our parent company and the ethical treatments of all those we serve. 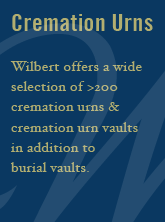 Please view the Wilbert Funeral Services corporate brochure for additional information on our history, burial vaults, urns, services, and outreach programs. Often, Wilbert licensee organizations are family businesses in which leadership and responsibility have passed from father and mother to a son or daughter. Likewise their customers — funeral directors and local funeral services businesses — are also frequently family-owned and operated businesses, many times persisting as such through three or four generations or more. Their customers in turn are more often than not also families, families undergoing transition through the death of a loved one. So, in this important sense, as the story of the Wilbert organization unfolds, it is a story of families.